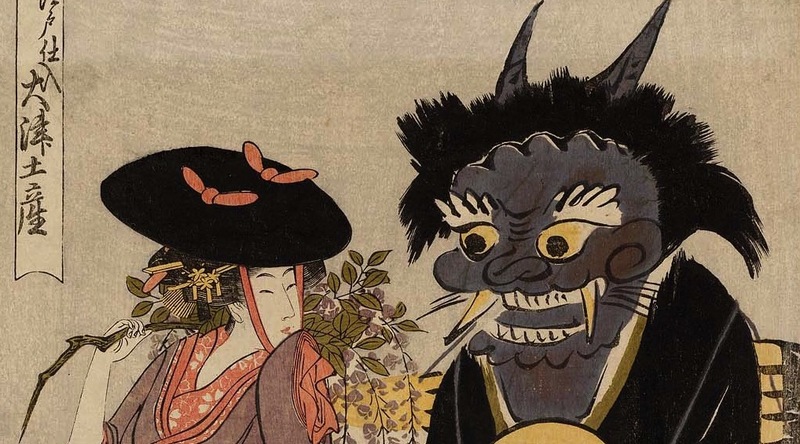 This year's series contrasts two major themes in kabuki dance plays: demons and beautiful maidens. In November we look at a play about a demon in search of an arm lost in battle; and end in March we look at two dance plays that feature beautiful magical "musume" or maidens. As last year, we will be screening full videos of live performances from the Shôchiku's Kabuki Meisakusen Series, which feature some of the greatest kabuki performers of the 20th and 21st centuries. The recordings have English language commentary, and we will also discuss important story and performance elements. And we will have green tea too! We are celebrating the second year of our partnership with the UBC Library. All salons will be held at UBC's I.K Barber Learning Centre, 1961 East Mall - in room 256 (The Chilcotin Room). The nearest parking to the Centre are the Rose Garden and North Parkades. Parking at UBC is $7 after 5pm. UBC Parking map. Presented by TomoeArts & UBC Library. A dance play written by Kawatake Mokuami in 1883 about Tsuna and the demon Ibaraki. The story's background is from the noh play Rashômon, where Tsuna cut off the demon's arm in an attack at the gate. 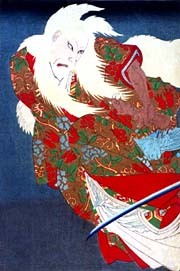 In this kabuki dance play, Ibaraki visits Tsuna disguised as his aunt Mashiba in order to retrieve his severed arm. Starring Onoe Baikô VII as the demon and Onoe Shôroku II as Tsuna. Image: Onoe KikugorôV in the role of the demon in Ibaraki. Print by Toyohara Kunichika. Two of the most famous of the musume dances - virtuoso pieces for "onnagata"- female role type - performers. Full of quick kimono changes, spectacular scenery and lots of dance props. The charming Wisteria Maiden and tragic Heron Maiden will steal your heart. Right: Seki Sanjûrô IX in "Fujimusume" at the Nakamuraza, 1826. 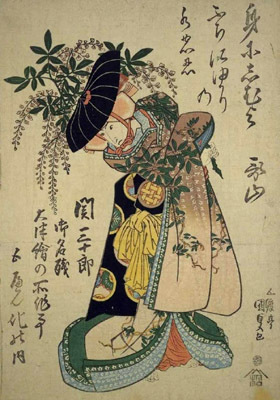 Print by Utagawa Kunisada I. Left: Nakamura Utaemon IV in "Sagimusume" at the Nakamuraza, 1839. 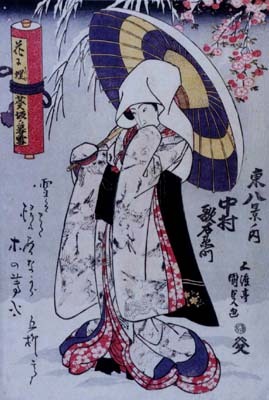 Print by Utagawa Kunisada I.